Speedy and packed with features, the Lexmark CX923dte is a black and white and colour multi-function machine designed with medium and large businesses in mind. This free-standing product offers high-standard printing, copying, scanning and faxing services that can handle the high processing needs of large and complicated projects. This highly versatile machine features a great range of optional additions from finishing functions to paper capacity updates, ideal for businesses requiring something extra. Simple to set up and operate, the Lexmark CX923dte is a powerful and proficient multi-function machine created to save time and money for medium and large businesses. The compact Lexmark CX-923dte is a stylish addition to most offices and will fit easily into most workspaces. Its standard design measures 1225 x 615 x 697 mm and weighs approximately 134.5 kg. Featuring a high level of paper handling, the product can accommodate a standard 1,150 sheets in three paper trays, which can be increased to a maximum of 6,650 sheets. It offers print speeds of up to 55 ppm in mono and colour alongside a fast first-time-to-print speed of up to 5.2 seconds. The machine provides image quality of 1200 x 120 dpi in both mono and colour. Finishing options include multi-position stapling, hole punch, booklet, saddle stitch, and tri-fold. 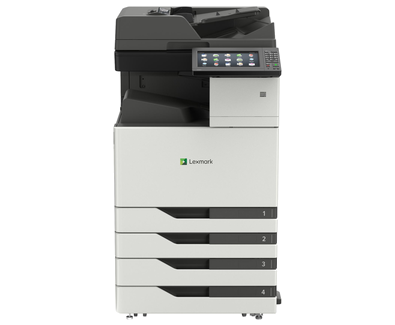 The Lexmark CX923dte is an ideal all-in-one machine for most medium to large businesses. With great output speeds, brilliant paper capacity and a wide range of additional extras, this device has it all. The unit can provide high-quality colour and mono results with amazing speeds and efficiency. The ten-inch touchscreen is an excellent interface to control the machine’s functions and setup. As a powerful and robust machine, the Lexmark CX923dte is definitely only suitable for medium and large businesses. The processing power and speed of this machine will not be required by smaller operations.